Don’t be mad letter C, I know I wouldn’t have cream, coconut or cantaloupe without you. But my Mother’s birthday, Mother’s Day, Memorial Day all start with the letter M. And, they all happen in the second half of the Month of May. Something special my mother really likes is coconut cream pie. So I make coconut cream pie for her birthday. See? Anyway, I’m really appreciating the Food 52 site lately. And this recipe from em-i-lis for coconut cream pie was, though I didn’t know until I found it, something I’ve sorely needed. Not too sweet, rich and creamy with a dense, real custard filling – no gelatin, tapioca or other textural trickery. Pure, true and perfectly coconut. Thanks em-i-lis & Food 52 for making my day. Even better? There’s a two-fer in this recipe. A homemade version of sweetened coconut flakes that’s so much more delicious and healthy than store-bought sweetened coconut. 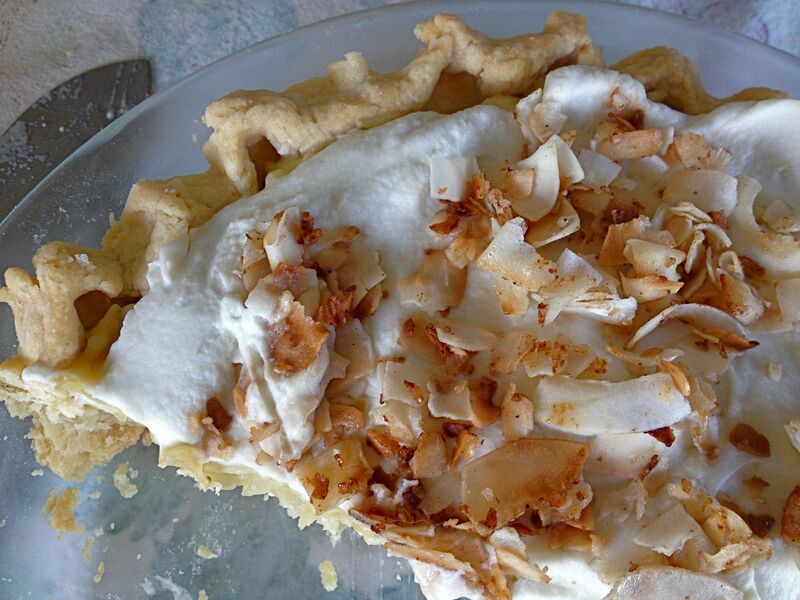 If you never ever make the pie, do yourself a favor and make the toasted, sweetened coconut. 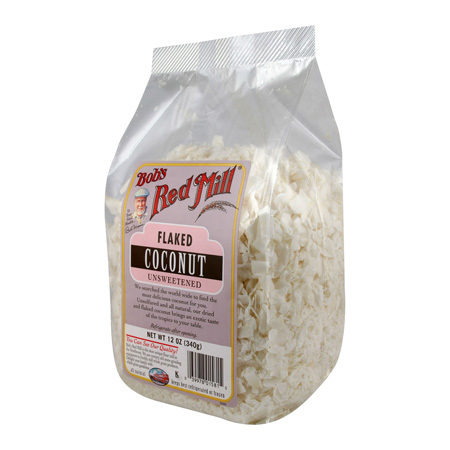 Thanks too, Bob’s Red Mill for these amazing unsweetened coconut flakes. I like a rustic, chunkier texture which I realize not everyone will prefer, but these larger flakes toasted are unique and special. If you favor a more delicate, finer grind, Bob’s has that too. I know. Coconut is not local to western Pennsylvania. While I’ve dramatically cut down on my dependence on non-local products, I still live in a world where lemons, oranges, almonds, avocados, olives, bananas and coconut are everyday items and they are sometimes impossible for me to resist too. Nor, as long as they are produced in a fair and clean way, do I see any reason I should. 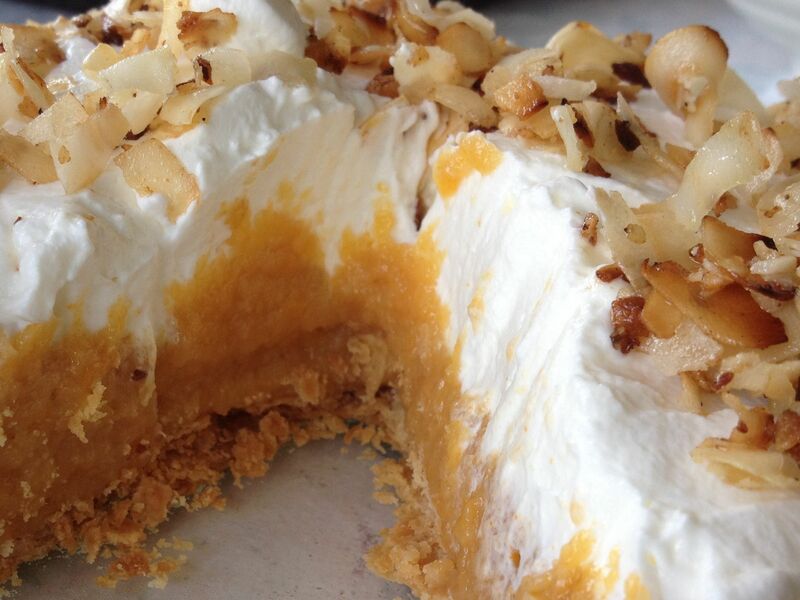 So, inspired by my coconut cream pie success, and cleaning out the freezer to make space for this summer’s booty, how could an idea be any more perfect than this: cantaloupe cream pie? 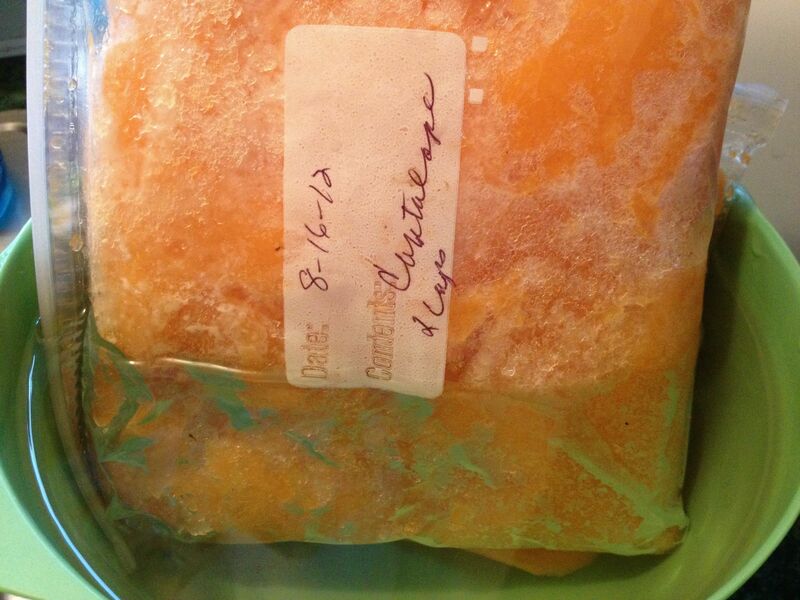 Em-i-lis’ recipe can easily be adapted for any pureed fruit, as long as the thickness of the fruit puree is right. Aiming to match the texture of the coconut milk called for in the recipe, I took four cups of cantaloupe puree from the freezer and reduced it to about 1 1/2 cups, which worked out perfectly. It doesn’t have to be exact, just pudding-thick. Success! Now I have a flexible, mix & match cream pie method for the juicy fruit bonanza coming soon. Peaches, plums, berries, cherries, pumpkin, squash… hurry up and get here already! How about you? What’s your favorite cream pie? I love coconut creme and I NEVER make it. BUT, I do keep a bag of Bob’s Red Mill Flaked Coconut in the fridge. It’s sooo good. I love to throw a handful in my smoothies. Thanks Em-i-lis, glad you aren’t offended by the liberties I take with recipes, lol. Your pie is truly perfect and I will be trying your crust one of these days. My mother’s birthday pie on a deadline wasn’t the right time for new crust experiments.